Leamington have snapped up former Coventry City Academy player Ryan Quinn. 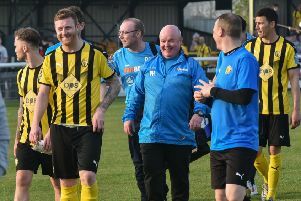 The midfielder was an assured presence in Brakes’ midfield for the friendly with Worcester City last Saturday and Paul Holleran says he is a player who can continue to develop at the Phillips 66 Community Stadium. “He’s done well and we want to see more of him,” said Holleran. The 20-year-old joined then National League side Nuneaton Town after being released by the Sky Blues in 2014. He finished the season with Coventry Sphinx and returned to the Midland League club after beginning last season at Chasetown, going on to make 28 appearances and scoring five times. Quinn will be pressing to be involved on Saturday but one player certain to miss out is Tom James who is serving a one-match ban carried over from last season. Joe Magunda also looks set to sit the fixture out with the midfielder only due to return from holiday on Saturday, while Richard Taundry is still struggling with a calf injury.